Hope to dig up plenty of treasure in Bonanza, a gold rush-themed slot from Big Time Gaming. It’s played using the developer’s MegaWays game engine where the number of potential ways to win can reach a mighty 117,649. Reaction-style symbol drops follow each winning spin. The main bonus is a free spins round where a dynamic multiplier can quickly get things moving. Play on your PC, tablet or mobile devices from between 20p and £20 per spin. The action in Bonanza takes place against a rocky hillside backdrop. There you’ll find A to 9 symbols as well as a quartet of more rewarding gemstones. The purple stone is the one you’ll be hoping to see. Land 6 of these on adjacent reels for a payout of 50 times your stake. Helping to create the winners are the sticks of dynamite which are wild. As usual, they substitute for all of the standard symbols. ‘Reactions’ take place whenever a winning combination is created. Those winning symbols are removed, new ones drop in from above and a new payout consideration is made. If this also results in a winner, then the process is repeated and keeps on doing so until there’s no winner on view. As a MegaWays video slot, the number of symbols on each reel changes with each spin. You can see how many are active in the meter above the reels. There’s 1 bonus extra in Bonanza. Free Spins feature – this feature is triggered by spelling out the word GOLD in scatters symbols. Your reward is 12 free spins. Each addition scatter from the triggering spin adds another 5 free spins to your initial tally. The ‘reactions’ are in play during the free spins too. Each time you get 1, it increases a multiplier by 1x – with no limits! Get on a roll with the ‘reactions’ the multipliers can deliver some potentially explosive results. Hope to see trolleys of gold bars trundle onto the reels too as they can results in a re-trigger and another round of 5 or 10 free spins. This doesn’t have the visual polish of some MegaWays video slots but this was the first one ever released! The design is good enough though, especially in combination with a classic country and western style backing track. The variance here isn’t as high as some MegaWays games either (Who Wants to be a Millionaire for example). The volatility is in the medium range but can provide wins of 10,000 times your bet on each free spin! It’s frenetic and a bit silly but Bonanza can still deliver some pretty good action. 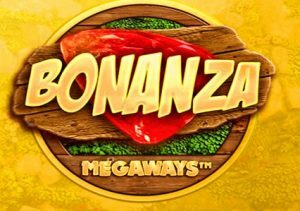 Get on a good run with the reactions in the Free Spins feature and Bonanza can live up to its name.